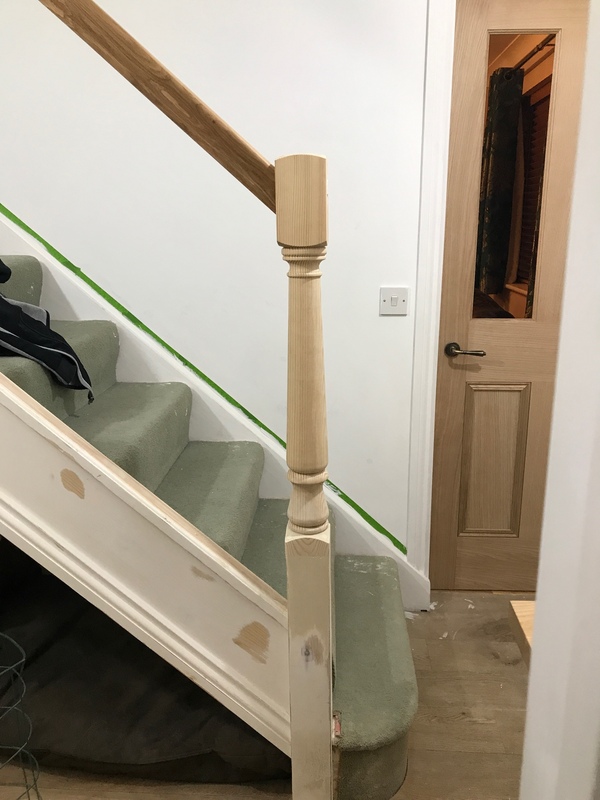 Hi, we have a carpenter that is upgrading our stairs, he has cut the existing jewels down and dowelled in some new posts, the existing jewels were not level originally, could he of done anything to rectify them without replacing the whole newels ? Yes, so its not level ? could he of done anything to rectify them without replacing the whole newels ? Yes, and no. The handrail and string set the position for the newels so just refitting to those with no alterations, the newels will end up just as out of plumb as they were originally. 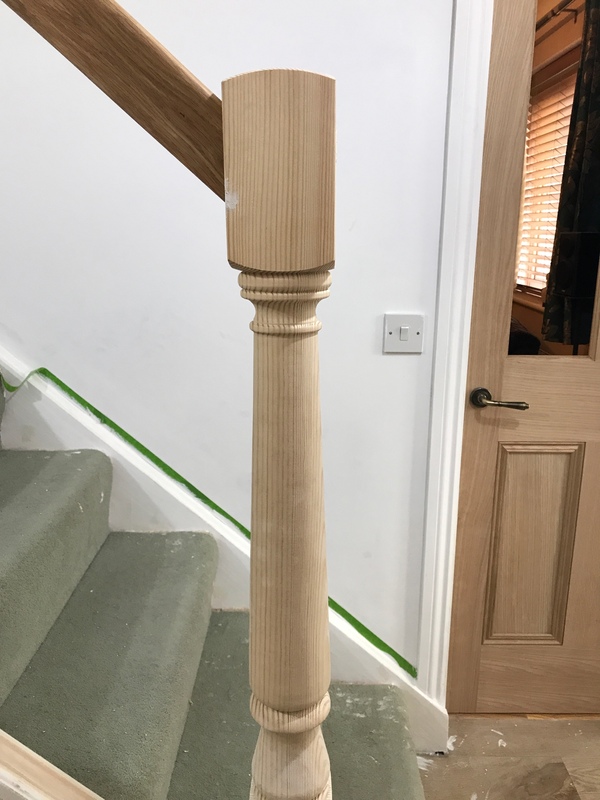 The newel in your pic looks as though the top wants to go to the right (of the pic) to plumb it up, if that's the case, you'd either have to make the handrail longer or the string shorter, (in this instance as the newel is joined above the string, it might have been possible to offset it a little, that depends on how much has been trimmed off the new newel to flush it up with the old newel stub - probably not much). One other way would be to lower the bottom end of the old newel, this will also lower the bottom tread on the newel side and may not be desirable if the tread is already level; and with the bottom of the riser buried under the laminate flooring it's a bit of a palaver to trim that back. I don't think any chippie would alter any of those things off his own bat, they're historic from when the stairs were originally fitted. Was the bottom post replaced as well. The post can either coming in 2 ways. 1: as a complete post or 2 : base and top ( bases is housed into the string and step and there is a hole on top of it for the dowel and the top post sits into it. From the picture it looks as if the base and top post are all out of line/ plum. Going as if the top post on the landing is square each side. Means that the carpenter cut the handrail to short. But that would only sort the top of the post out. If the base of the post is out it will need adjusting a as well. The existing post has been cut down, I think it’s tenon jointed and fixed using steel dowels. The base is not level and I think he tried to correct it by levelling in the new top part but it didn’t look right so he mentioned to me that it wasn’t quite level. What I’m trying to say is that is this acceptable work and is it common for newels to be out of plumb ? Fitting to the exsisting newel and handrail is fitting between two fixed points so doesn't give much leeway. He could have used the handrail as the fixed point and moved the lower end of the new newel closer to the string to plumb it up. This would have left a small step which would mean the front face of the exsisting newel would need paring off and possibly the back face building out to prevent it looking tapered . In all honesty it would have been easier to replace the whole post. Is it acceptable? That one's up to you as you're the one who has to live with it. Is it common for newel to be out of plumb? Probably more common than one would think even if they should be plumb. Probably not helped by the door looking as if it's out of plumb the other way unless that's camera distortion? Is this one better ? The door frame is dead level on the left, I suppose it’s not that bad by eye but sprit level tells a different story. Seeing as it's been already fitted then your options are either to live with it or to ask for it to be completely replaced. How you wish to approach that is up to you but as it appears that the carpenter has replaced like for like and the original appears to have been out it could very well be reasonable to expect to pay him again iff there was no agreement prior to change the lean of the post. In our house it probably wouldn't be noticed as my wife and daughter routinely hang their coats on the newel at the bottom of the stairs. did he use a jig off some sort on the top off the stump ?? is the one at the top leaning as well to match the bottom one ?? I'm wondering if he thought fitting a new section plumb to an out of plumb might end up with the post looking "bent"? Hi, I've measured the length of the new handrail and the base rail, the handrail is approx 24mm shorter than the existing base rail ?